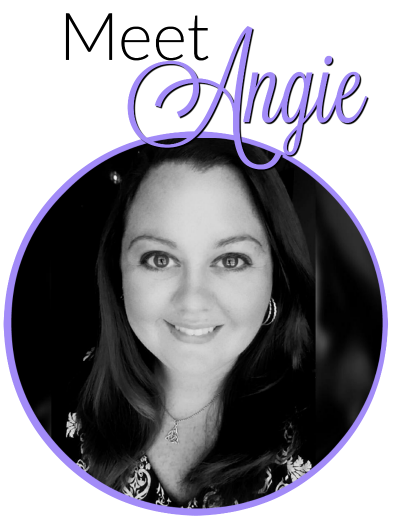 August is a Big Month for us as far as birthday go! 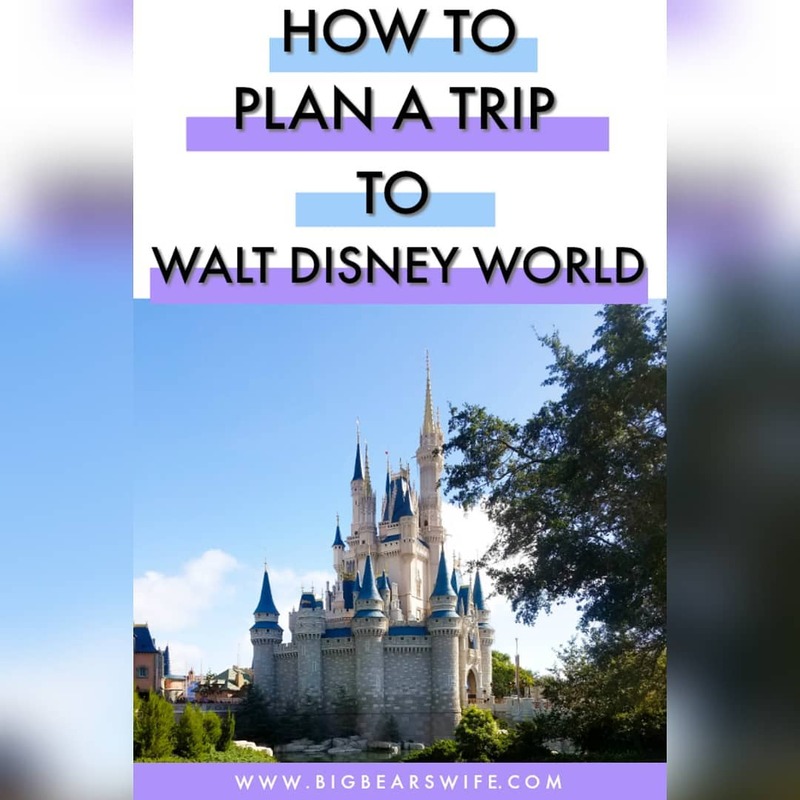 Big Bear’s Birthday is in August, Big Bear’s Cousin Ariel’s birthday is in August, Savannah’s Birthday is in August and My Dad’s birthday is in August! But I suppose you’re not really here for Birthdays are you? 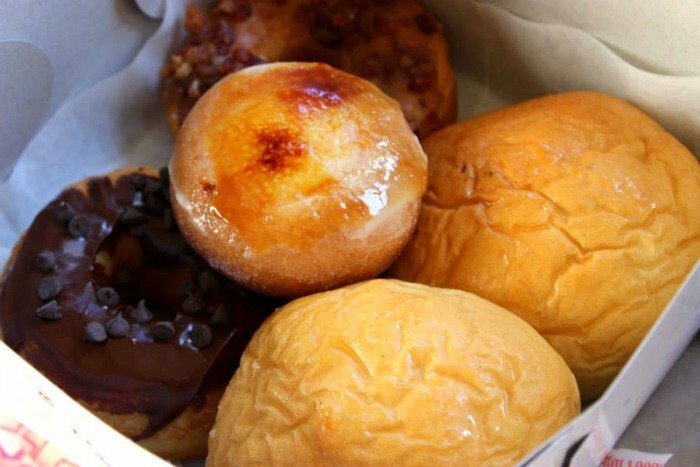 You’re hear for the 6 MUST TRY snacks/treats for when you’re in Hawaii, right?! Because if you’re going to make the trip all the way to Hawaii you’re going to want to make sure that you chow down on some of the best food there, right?! 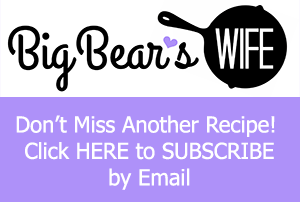 BigBear and I where in Hawaii for a week in February and I still didn’t get to try everything that was on my list but here are 6 amazing treats that we fell in love with! This is Manapua! 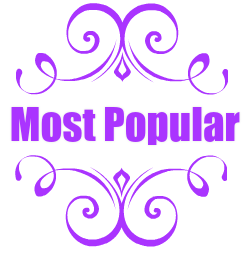 It tops my list because it is the one thing that I just couldn’t get enough of! I was in search of this gem from the moment our plane touched down and once I found it I was trying to get one every time we went out! 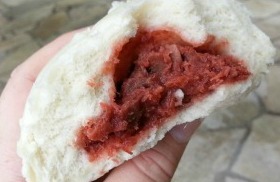 Manapua is a steamed bun filled with pork. It’s highly addictive, for me anyways! On our last day in Hawaii, I made BigBear walk like 5 or 6 blocks with me down to a little shop called Lawson Station (in Waikiki) to grab one last Manapua before we headed to the airport. I tried baked Manapua in Chinatown but it wasn’t very good in my opinion. The steamed Manapua has won my heart! Spam Musubi takes the #2 spot because it was BigBear’s favorite snack while we were in Hawaii. Now wait a minute! Don’t turn your nose up at this little treat! 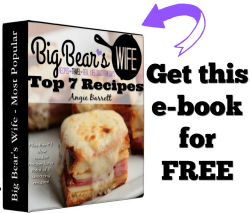 I am not a fan of spam, it kind of weirds me out and I have no desire to normally eat it… like ever! But when we were in Hawaii I wanted local food and Spam Musubi is local food! We found a little hole in the wall shop (literally, it was a doorway and that was it) that was selling musubi and some other lunch items and decided to give it a try! Big Bear inhaled his and I was still on the fence. I took a bite…. mmmm ok I didn’t die, I took another bite…that wasn’t so bad. I took another bite, oh this is actually kinda good. I took another bite and bam, it IS super good! 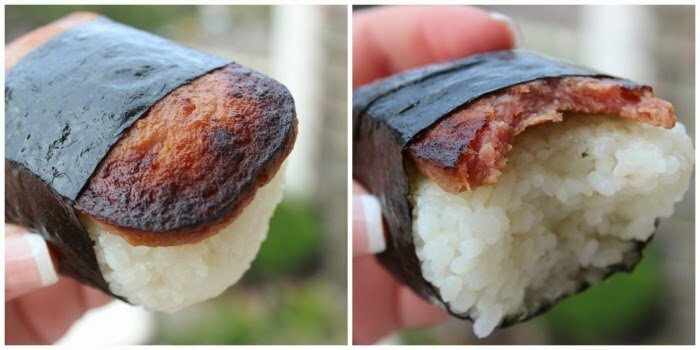 Musubi is probably the only way I’ll ever eat spam but I can’t say no to these! I even recreated them at home and posted about Spam Musubi on the blog! 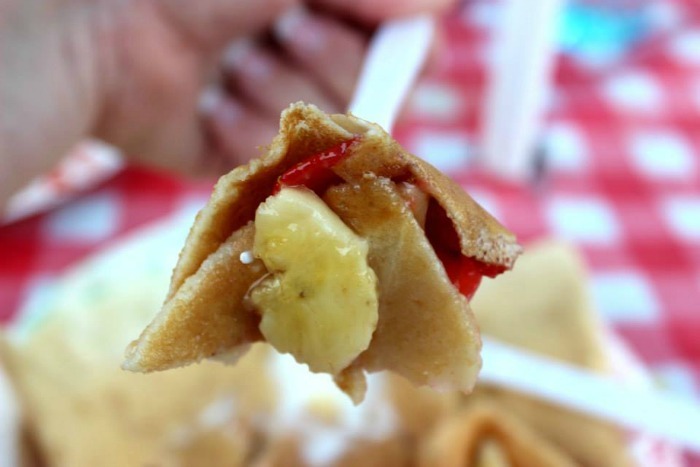 This crepe came from a food truck on the North Shore called,Délice Crêpes! We stumbled onto this little spot after having lunch at Giovanni’s Shrimp Truck and I just had to stop and try one of these crepes! I have been longing for an amazing crepe since I was in Paris almost 14 years ago. Yes, it was that good that I still think about it now! After realizing that the owner of Délice Crêpes was actually from France I had high hopes for this crepe! I ordered, took a bite and I was transported straight back to Paris, France! I may even say that this crepe was even better than the one I had back then! I ordered the HALEIWA Crêpe which was Honey, Strawberry & Banana! If you’re on the North Shore of Oahu, make sure you visit Jonathon at Délice Crêpes and pick one of the awesome crepe flavors from his menu board! We actually found this little bakery by accident when we were looking for Manapua in Chinatown! We grabbed a few donuts to try out and we both found a favorite! 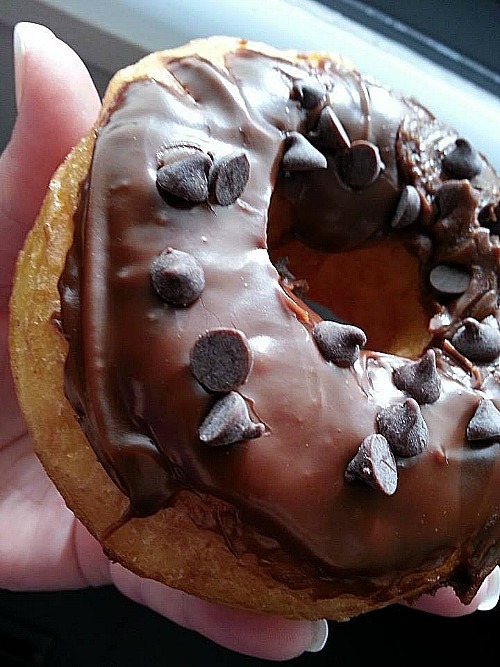 I loved the chocolate glazed chocolate chip donut! Big Bear loved the Maple Bacon donut. We BOTH loved the creme brulee donut! Next, we have Malasadas from Leonard’s Bakery! Now we tried a few other malasadas that we found throughout Hawaii at different bakeries and shops but Leonard’s was by far my favorite! 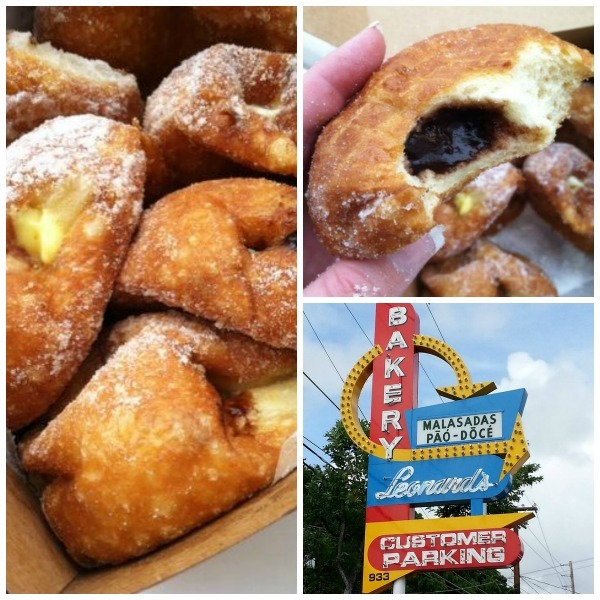 If you want to be exact, it was the chocolate filled malasada that had my heart fluttering! 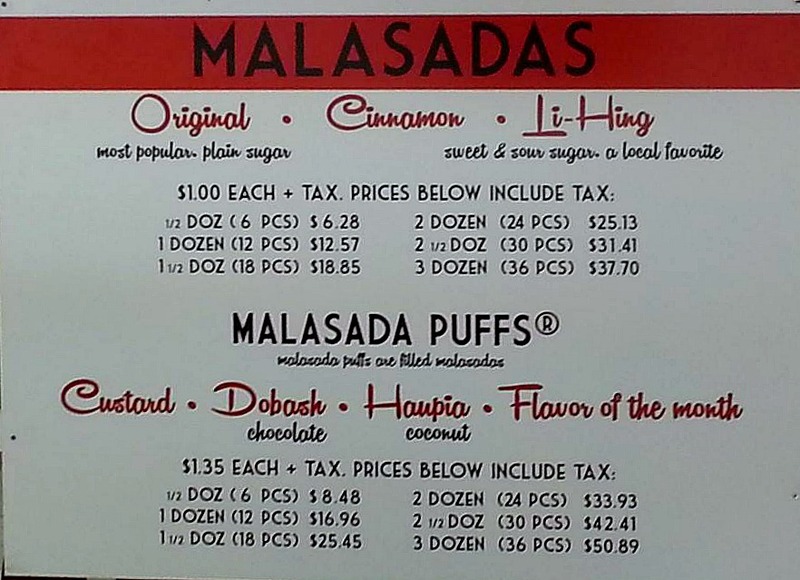 Malasadas are fried dough that’s coated in sugar! Some didn’t have fillings but we found some that were stuffed with chocolate, coconut and custard! We bought 1/2 a dozen and they didn’t last though the afternoon and evening! Last but not least we have Mochi Ice Cream! Now I’m really sad that I don’t have a good photo to show you of the actual Mochi Ice cream! I’m so sorry! I seamed to always pick these up at night when we were walking around and I just couldn’t get a good shot of them. However you can see the photos below on the display! My favorites were: Choco Mint, Mango and Choco Espresso! It’s kind of hard to explain. It’s ice cream. It’s Ice cream that’s wrapped in a rice flour shell. Well that’s what it says when I looked it up online. Now that doesn’t sounds very good but oh it is! When you bite into Mochi Ice Cream it taste like you’re eating ice cream with a marshmallow shell! Marshmallow covered ice cream! YEP! That’s exactly what it taste like! 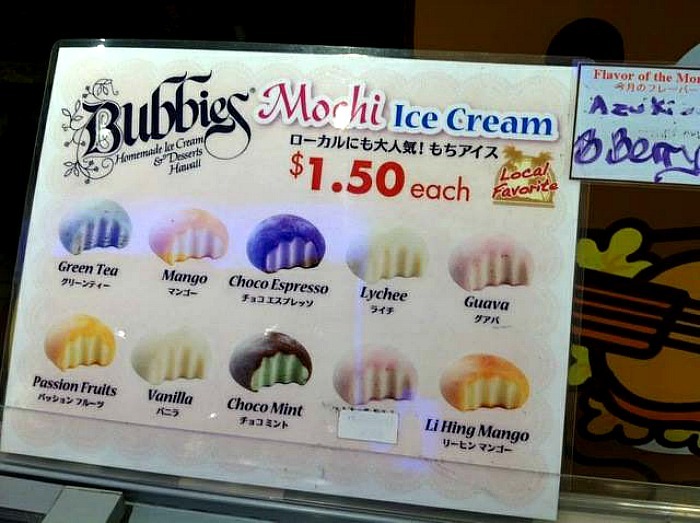 Oh and while I was checking out some things online about them I found out that you can order Mochi Ice Cream from Bubbies online! I feel like I’m going to be placing an order very soon! 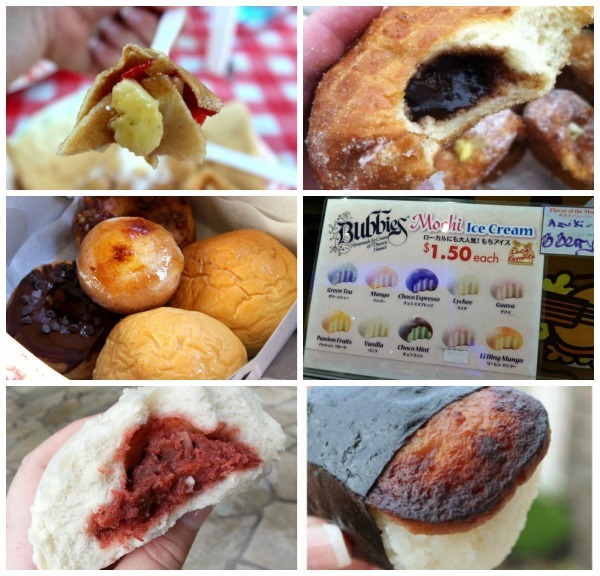 So… that’s that 😉 6 MUST TRY snacks/treats for when you’re in Hawaii – Oahu, Hawaii!! Which one do you think you’d like the best? It’s been three years and I still desperately miss Musubi! 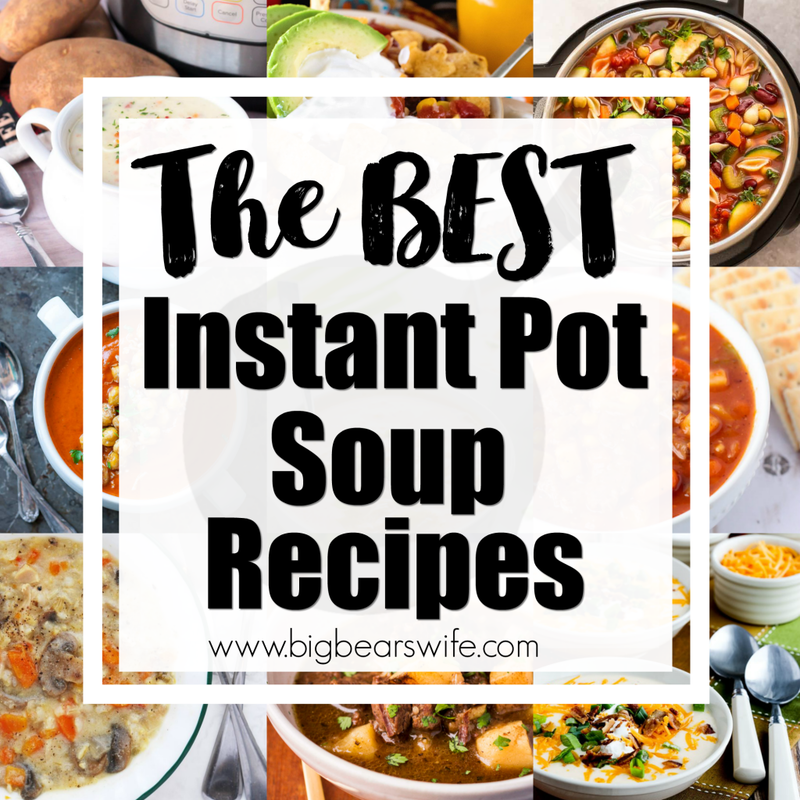 I’m going to have to give your recipe a go here very soon. OK, I’ve been to Hawaii twice, but never had ANY of these! I think I MUST return, don’t you???? I’ve never been to Hawaii, but I know what snacks to look for when I do! Especially Spam related snacks! Everything sounds and looks amazing! Hawaii is basically a pipe dream for me until my kids grow up. I think I need those brulee donuts in my life. I always found it funny that Hawaiians love their spam. I’ve actually never tried it but that dish looks good. Oh my goodness, it all looks so good! I’ve never been to Hawaii but now, if I go, I’ll know what to look for! Hawaii is on my travel list and now I must seek every single one on these places out! I’ll even eat SPAM! All of these things look delicious! I really hope that I get to go to Hawaii Island one day…that Spam Musubi is first on my to-try list! I’ve never been to Hawaii and now you’re making me really wish I had! Putting it on my retirement bucket list. You know how much I love Hawaii so this is awesome. Hoping to take Kiana there next year since that’s where her name is from. I will make sure I have one, or three, of everything on your list. That doughnut looks amazing! I wish I was in Hawaii right now. I haven’t been to Hawaii in years! Now I really, really want to go back, even more than before looks delicious! Ok, so now all I want to do is go back to Hawaii. Sigh. I’ll add these places to my bucket list for when I get to Hawaii! Hope they’re all still there by the time I finally get there! I need to get back to Hawaii stat! I’ve never been to Hawaii, but this is tucked into my back pocket for when I DO get there! My favorite of them all is mochi. They sell those at trader joes and I get them every chance I get. But it must be nice to go to Hawaii. I would love to go!